In order to prevent the vehicle's battery from discharging, the interior lighting functions are automatically deactivated after some time except for when the SmartKey is in position 2 in the ignition lock. The color and brightness of the ambient lighting can be adjusted using the on-board computer . 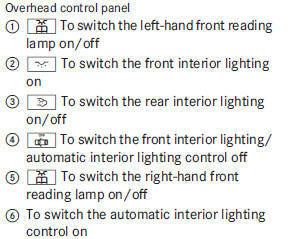 ■ To switch on: set the switch to center position 6. • unlock the vehicle • open a door • remove the SmartKey from the ignition lock. The interior light is activated for a short while when the SmartKey is removed from the ignition lock. You can activate this delayed switch-off using the on-board computer . 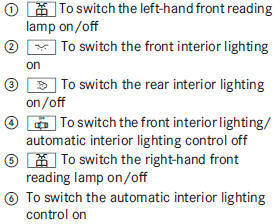 ■ To switch the front interior lighting on: set the switch to the position. door is closed) to the center position. 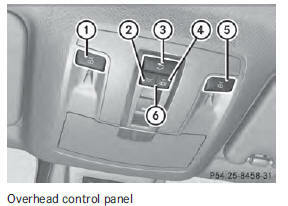 ■ To switch the rear interior lighting on/ off: press the button. ■ To switch the reading lamps on/off: press the button.